Three weeks after the start of the Camp Fire in Butte County, the deadliest, most destructive wildfire in modern California history, thousands of residents from the town of Paradise and surrounding communities ravaged by the blaze are still living in shelters and tents or staying with friends and relatives. Although the Federal Emergency Management Agency has been providing hotel vouchers to those displaced by the fire, many survivors are frustrated that few longer-term solutions have been provided. 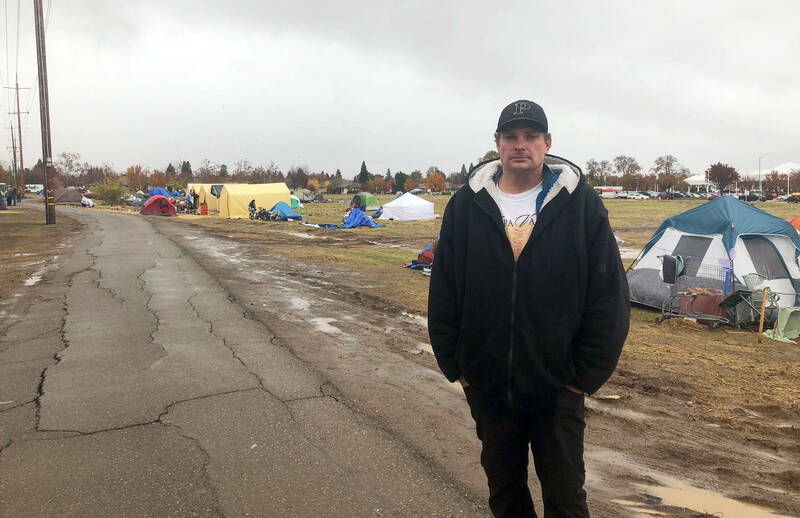 Since he fled his home three weeks ago, Ulis Gordon has been staying in a tent in an empty lot next to a Walmart in nearby Chico. The lot has turned into a makeshift refugee encampment, where dozens of tents housing displaced survivors have sprung up since the fire. The first word Gordon used to describe the experience? "Cold. And then of course, you know, we get to [deal with] the people who are stealing our stuff," he said. "Clothes, boots ... My dad got me boots for Christmas. That was taken, out right in front of the tent. It kinda pisses me off." Gordon said he and other fire survivors need FEMA to set up trailers to temporarily house displaced people. "FEMA should already have had them set up," Gordon said. "They’re already preset units. So what is the problem with getting them here?" FEMA spokeswoman Jovanna Garcia said it's not that simple. For one, the agency still needs to finalize locations for the trailers that are available. And she said it’s unclear how long that will take. "We can't just go ahead and put these mobile homes in any place," Garcia said." We can't just say 'There's going to be a commercial site' and put it there without looking at the infrastructure of it. We have to see if there’s electricity, water, sewer." Garcia says FEMA has more than 80 trailers ready to go, but that would barely begin to house the more than 2,000 people that need them. The hotel vouchers FEMA has been offering are only good for up to 90 days. But the agency said that once the trailers become available, fire survivors could likely live in them for at least 18 months.